Growing up we would spend at least one full day dyeing Easter eggs. We would start with dozens of eggs, and my mother used to hard boil some and let us make blown eggs with the others, and inevitably we always ran out of eggs because the fun in dyeing dozens of eggs was endless! 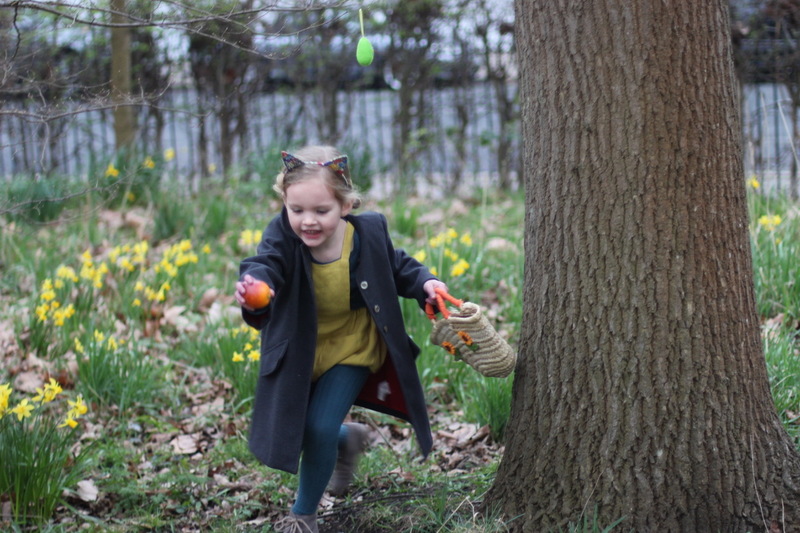 It was the perfect prep for big Easter Egg Hunts with lots of friends, and for delicious egg dishes to enjoy for the week after Easter! But, when I moved to London I was surprised that the shelves of grocery stores weren’t filled with the classic American Easter Egg decor craft — Paas kits. They have little coloured dye tablets that you drop into a solution of vinegar and water. We always ask friends visiting the states to bring some Paas kits back. However, this year I am also excited to try this OkoNorm, natural, eco friendly, plant based egg dyeing kit on our holiday. It is so small it fits into a card sized envelope, great for travelling with and it doesn’t need vinegar, it works with just water! But before we go on holiday, we wanted to have an Easter Party with our sweet school friends. 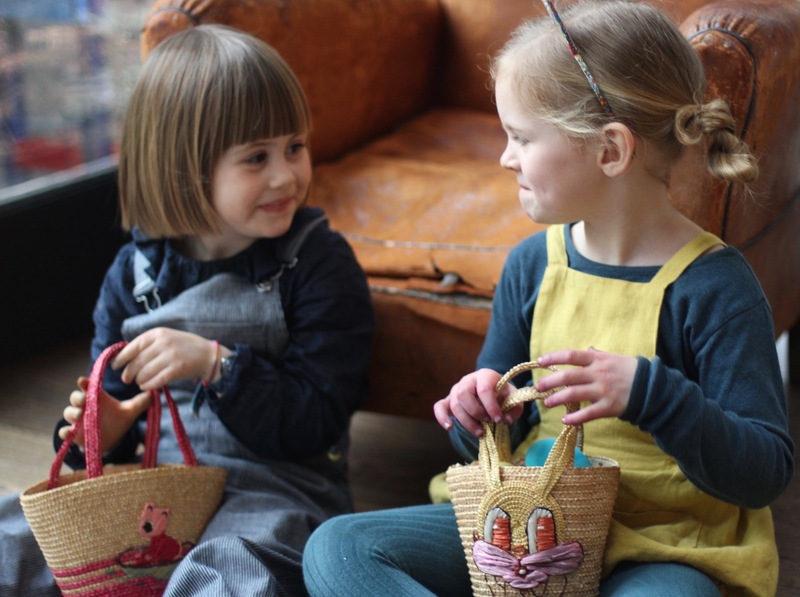 So we spent a day with them sharing our traditions of dyeing eggs, playing, hunting and eating… and it was delightful. There is such pride and excitement in the egg making! We used white pre-boiled chicken eggs. I prefer white ones since they take the dye better than brown eggs, but you might like that end result! And then for our hollow eggs, I used duck eggs, prepped the night before by doing blown eggs. (See this great video by ArtBarBlog for tips.) Duck eggs work well since they are strong egg shells. And they are slightly larger eggs so it looks impressive as decor. 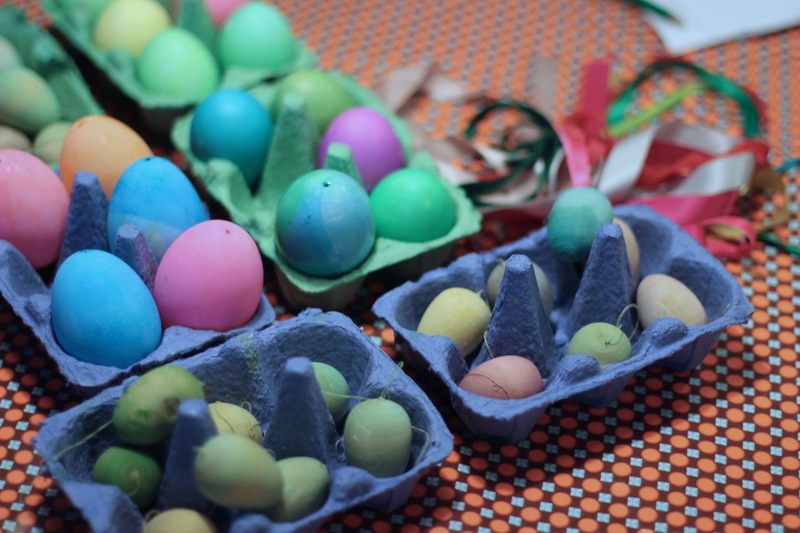 We also used these sweet wooden eggs to dye and decorate with. I love that they can be reused for both hunts and decor year after year! And the tones in the eggs are more subtle, with the beauty of the wood grain showing thru. Then after a few hours of dyeing, we needed some fresh air. 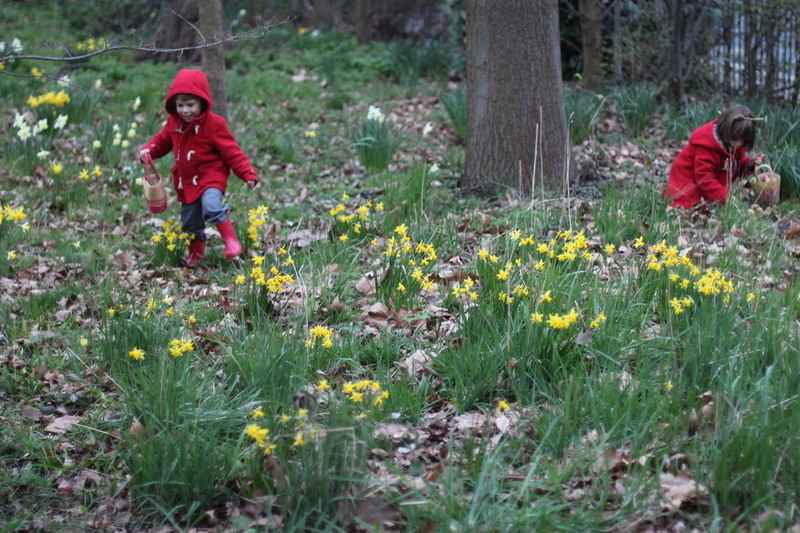 So, we went out for a hunt in the daffodils! 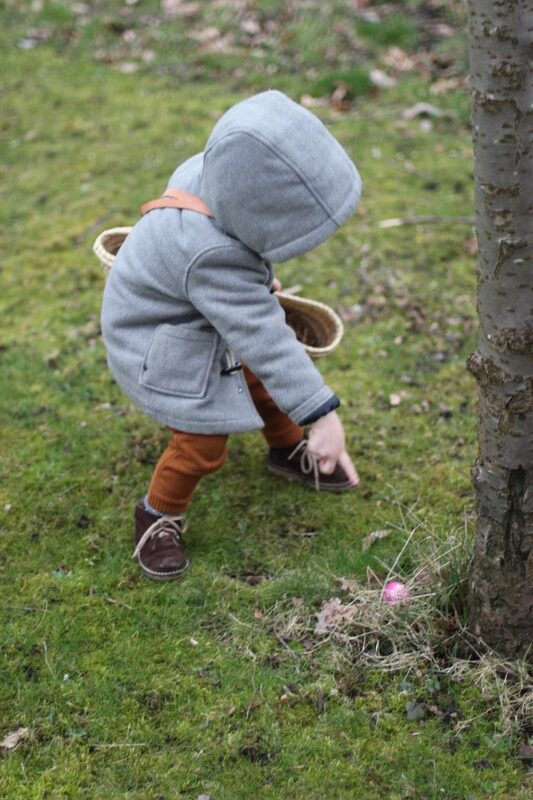 We hid our wood eggs, some oranges (a healthy option), and of course some hollow chocolate eggs too. 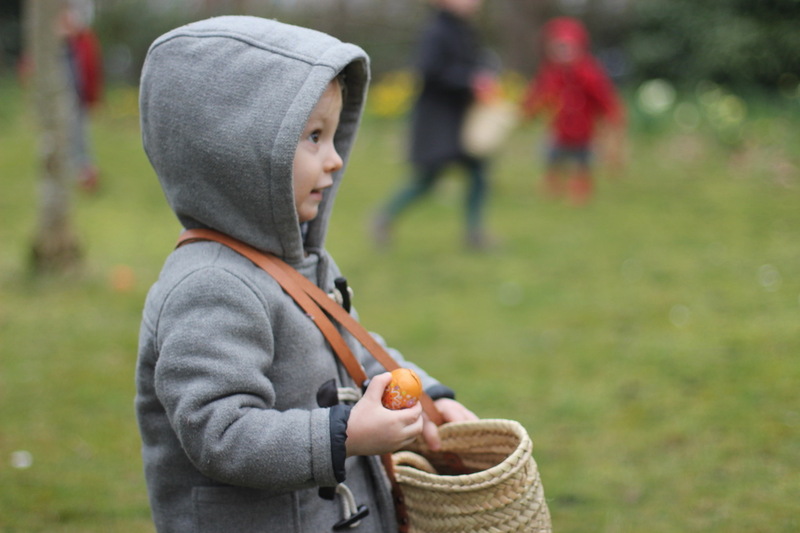 Despite the grey and soggy weather, the four friends had so much fun running around to find eggs and fill their baskets. 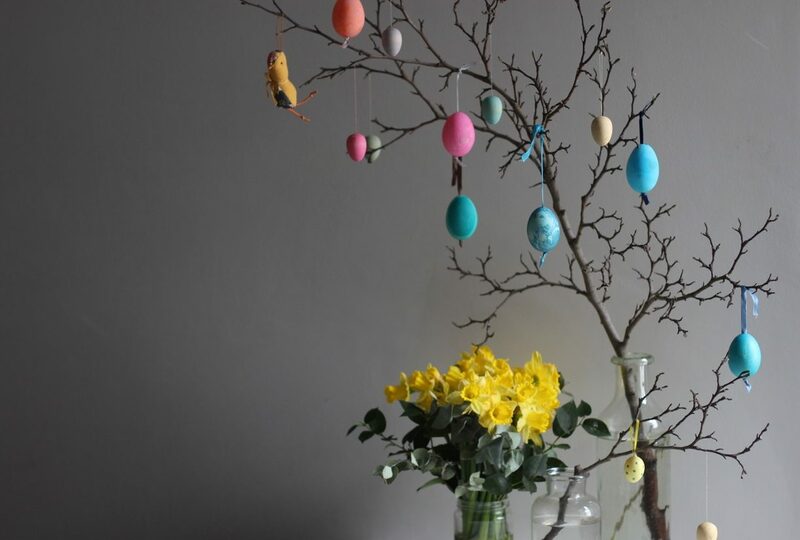 With the wooden and blown eggs, I love that they last forever. Just like Christmas ornaments it is wonderful to revisit them after a year of being stored away. 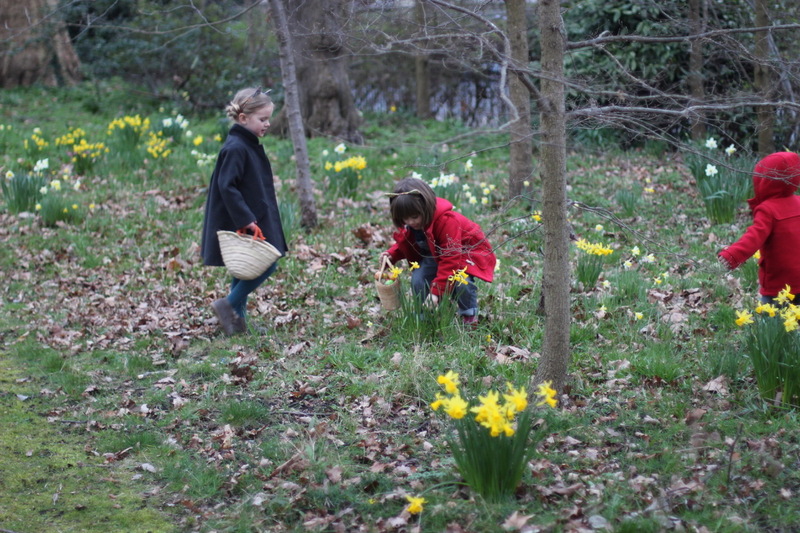 And we don’t use blown eggs in our easter egg hunt — they are simply too fragile. 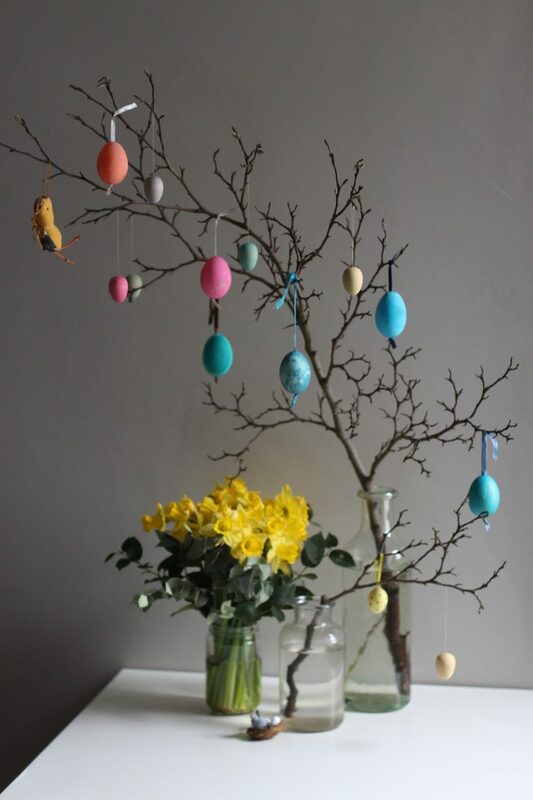 Instead we use blown eggs for display on our Easter Egg branches at home. 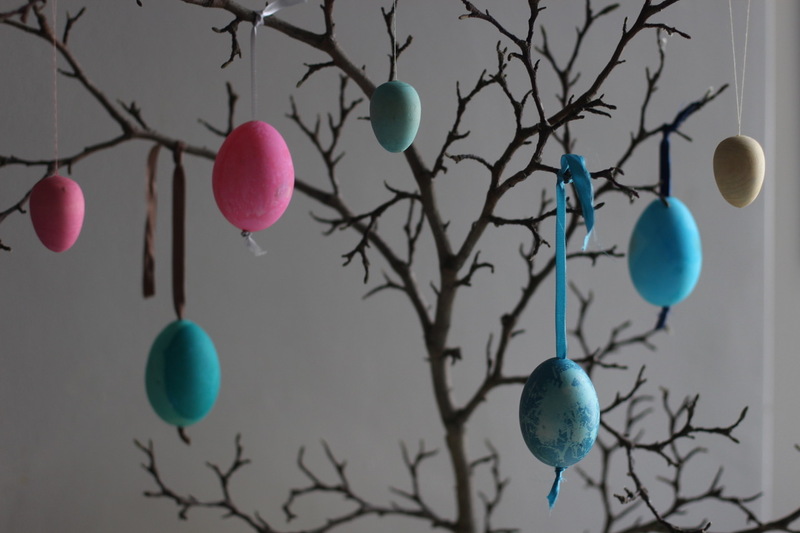 And some of the blown eggs on our Easter tree are over a dozen years old! 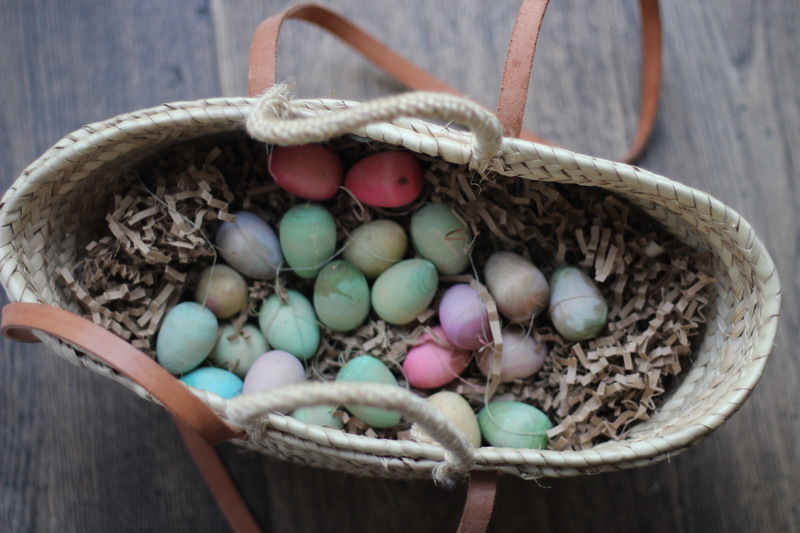 As much as I love doing natural easter egg dyeing, having a kit makes life super easy. 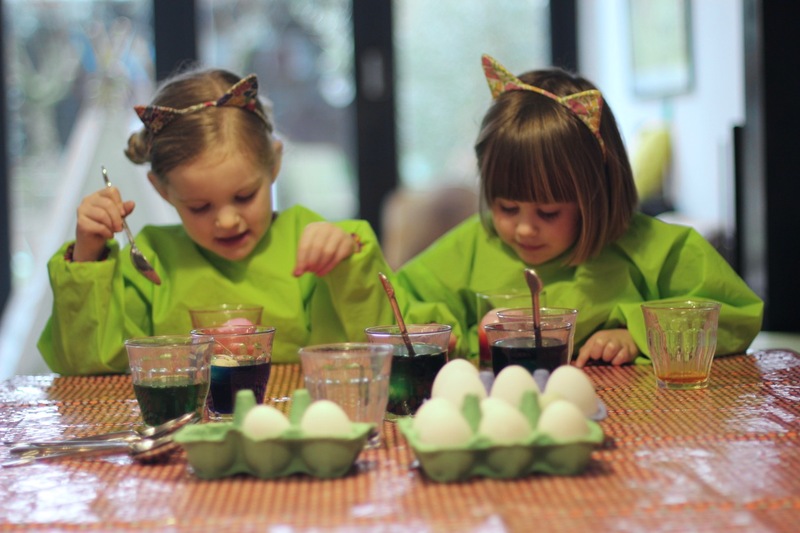 There are so many options for Easter Egg painting, dyeing, marbling, crafting, and more, that the list really does seem endless. Enjoy all these options for your Easter fun. I hope it brings some colour into your home after a very long winter! Hello Ellie, Thanks for your note! 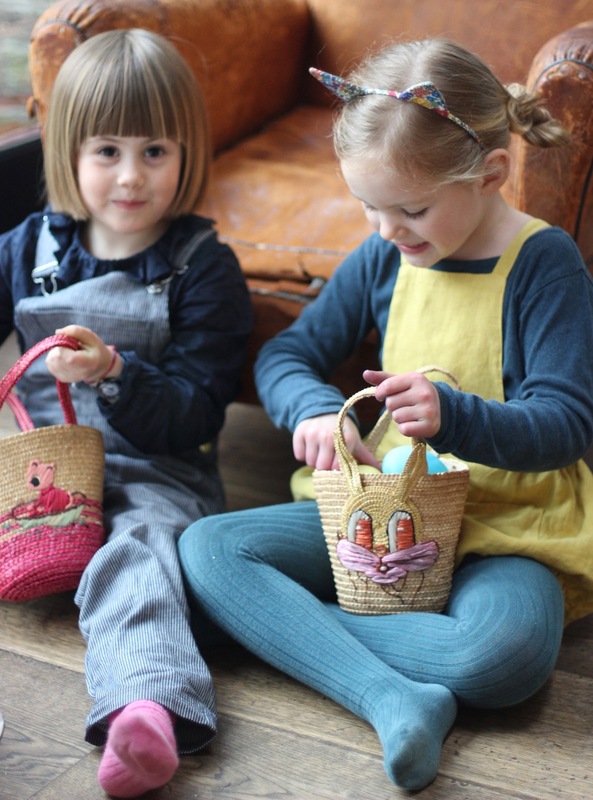 The baskets were from an antique market in Amsterdam years ago. I only wish I had bought more!